Here is a collection of “Weekend Designers” applying their talents. Bravo! Suma should be proud of her first attempt at patterndrafting. Here’s the result: a beautiful fuschia ruffled top based upon the RUFFLED TOP draft. She modified the ruffled armsyce and boat neckline to achieve a perfect fitting garment. An excellent piece of quality workmanship from Anna on her houndstooth bikini for her photoshoot based on the BOW -TIE BIKINI draft tutorial. 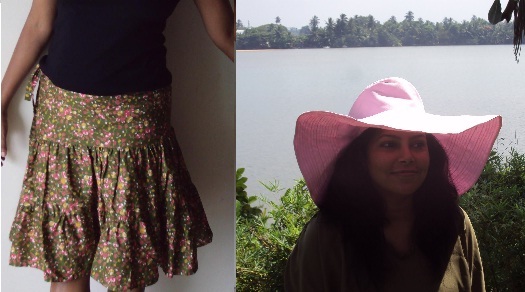 Suma in Sri Lanka tried her hand at pattern-drafting and created her own OXO SKIRT and WIDE-BRIMMED SUMMER HAT in lovely pinks & greens. For a recent wedding occasion, Sarah made a shorter version of the HALTER GOWN. Beautiful! From Jessica, using the DIRNDL SKIRT tutorial and a dynamite fashion fabric. This version of the NAUTICAL HALTER by Jessica is a knock-out in taffeta and satin ribbons for her engagement party. Maria’s version of the ISLAND FLOUNCER is an empire cut. An excellent way to make the patterndrafting suit your body shape and size. From Patty, here is the red contrast version of the HIP HOLSTER in blue denim. From Erica in recycled leather. The design was inspired by TV spy series, BURN NOTICE. From Donna, using the DRAPEY BLOUSON tutorial and a mod geometric stretch jersey. From Patty, using the directions to make the COVERT SCARF for her husband for Christmas. She used 200 polar fleece in burnt orange for the scarf and a nice stretchy Supplex for the pocket and binding.